Europe's deer farming industry started in Scotland. 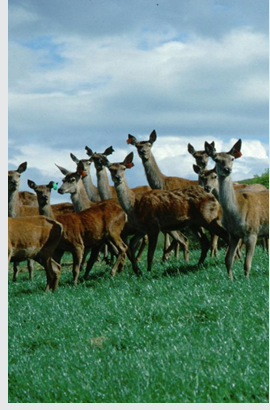 The initiative came from Sir Kenneth Blaxter at The Rowett Research Institute outside Aberdeen, and in 1969 an experimental deer farm was started at Glensaugh, near Fettercairn to find out if red deer would make an economic alternative to heavily subsidised hill sheep. The deer farm still exists. 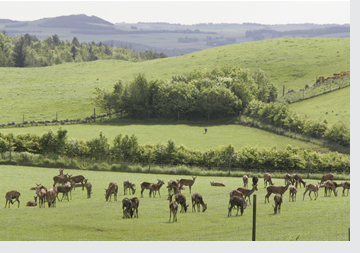 The first fully commercial deer farm was started in 1973 in Fife, and today there are around 30 deer farms around Scotland, from Orkney to the Borders, all farming red deer. Initially, deer farmers concentrated on providing breeding stock to meet the ever-increasing demand, and deer from parks and Highland estates were recruited into farming herds. Some estates built catching and handling facilities so that their annual hind and calf cull was taken alive instead of being shot. Nowadays there are enough farmed deer to provide breeding stock for UK farms without recruiting from wild stock, and Scotland's deer farmers, instead of trying to be store calf producers, breeding stock producers and finishers all at once, have now become specialised, with store calf producers in the uplands, and finishers on the low ground better pastures, just like other livestock industries. Deer farmers like to talk of ‘finishing' their deer rather than using the beef term ‘fattening' because one of venison's main attractions is that it is so low in fat. Farmed deer are raised on grass, with generally only young stock (calves) being housed during their first winter to protect them against the elements. Farmed deer are extensively grazed on grass, supplemented by hay, straw, and roots such as potatoes in the winter. Because deer lose their appetite and ability to grow in the winter, there is no point in feeding expensive concentrates, though some young stock are given grain such as barley for a few months until they are turned out onto the spring grass. The Moredun Research Institute at Roslin outside Edinburgh has, over the years, made several studies on diseases, potential or otherwise, in farmed deer, though such intrinsically healthy animals are not disease-prone when properly managed. For this reason drug usage is usually restricted to worming. Prime farmed venison comes from deer of less than 27 months, this cut-off age being because the meat (especially from males) becomes progressively tougher after that. Older cull deer are used for manufacturing to ensure the consistent quality of farmed venison. Farmed deer are slaughtered and processed under the more stringent regulations for red meat. The main difference between farmed deer and other livestock is that it is permissible to shoot deer as they graze in the field, rather than transport them to an abattoir, though a small proportion of Scottish farmed deer do go through a specially designated abattoir. Most farmed venison sold in Scotland has been field-shot. Scottish farmed venison is sold at farmers markets, through farms shops and specialist urban outlets, including supermarkets and restaurants, and several deer farms offer a direct mail order service. All the major supermarket chains sell venison although not in all of their stores. Demand is growing and the shortfall is met at present from New Zealand deer farms.